Beet and Goat Cheese Salad with Egg is served on a bed of Spring Mix Salad, then sprinkled with Hazelnuts, and finally drizzled with Balsamic Vinaigrette. It is simple, healthy, hearty and delicious! This easy Beet Salad was a play on this BEET & FETA salad that is one of our favorites, check it out! PIN this recipe to your Salad Board on PINTEREST. This Beet Salad is great served as an entree for lunch or even dinner. The combination of eggs, nuts and goat cheese keep you pretty full, but don’t make your stomach feel heavy. If you feel like you still need some kind of a grain to stay full, add a couple spoonfuls of cooked quinoa and you’re all set! What is a good Goat Cheese Substitute? You can substitute goat cheese with feta, blue cheese or omit it altogether if you’re not a fan. 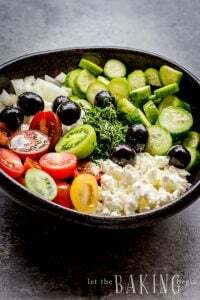 Keep in mind that crumbled feta typically has a milder flavor than the one sold as a block or large cubes. What can I use in place of hazelnuts? In place of hazelnuts you can, use walnuts, pecans, or leave them out. 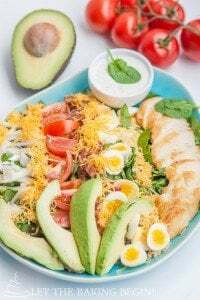 Keep in mind that you can omit one ingredient out of the recipe, the salad will change flavor a little bit, but not drastically. But, if you replace or omit more than one, the flavor will no longer be what it originally was supposed to be. Just something to keep in mind. How to make this Beet Salad with Goat cheese and Eggs FAST & EASY? 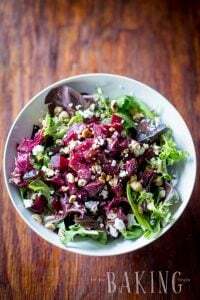 If you’re looking at the beets in this recipe and thinking – “well, this is going to take forever”, let me tell you a little hack on how this salad can be made in 15 minutes from start to finish. Whenever I am at the grocery store I make sure to keep my pantry well stocked with a couple cans of boiled baby beets. Yep. Canned. They taste just like the beets you would boil or roast yourself. PLUS, they’re small, so when you cut them into wedges and they look super cute in this beet salad! How to cook a Soft-boiled Egg? Ever since I bought an Instant Pot I have fallen in love with cooking mostly everything in it. This includes the eggs as well. You can cook the eggs in a sauce pan and cook them for 3 minutes past boiling point, or steam the eggs in an Instant Pot for 3 minutes on LOW pressure. Check the bottom of the recipe card for detailed instructions. What is YOUR favorite Beet Salad? SHARE with me in the comment section below! I would love to hear about what you are making! Beet and Herbed Goat Cheese Terrine – Colored beets for that “wow” factor. Creamy Beetroot Salad – Simple, but a favorite for years! Layered Beet Salad with Herring – Shuba – Replace the herring with smoked salmon if you’re not feeling too adventurous. Beet and Goat Cheese Salad with Egg is served on a bed of Spring Mix Salad, then sprinkled with Goat Cheese, Hazelnuts, and finally drizzled with Honey Balsamic Vinaigrette. It is simple, healthy, hearty and delicious! Add the pressed garlic cloves, mustard, salt, pepper, honey and balsamic vinegar to a bowl and whisk together. While continuing to whisk, drizzle the olive oil until all oil is added and the dressing is thickened. If the dressing is too thick, add 1 tsp of water at a time and whisk until desired consistency. Spread 1/2 lb of spring mix baby leaves on a large platter. Top with beet wedges, then add crumbled goat cheese, chopped roasted hazelnuts, and the egg wedges. 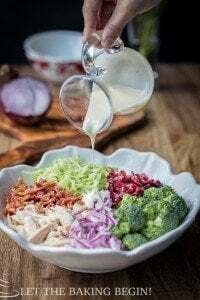 Drizzle with some dressing. Cook about 6-7 eggs at a time in a small sauce pan. Add enough water to cover the eggs and bring to a boil over hight heat. Then turn the heat to low-medium, set a timer for 3 -4 minutes (depending on your preference of how "soft" you would like it) and cook it until the timer goes off. Then drain the water and fill the sauce pan with cold running water. Start peeling as soon as the eggs are cool enough to handle. How to cook a Soft-Boiled Egg in an INSTANT POT? Fill the insert pot with 1 cup water. Set the steamer basket on top and add 6-7 refrigerated eggs. Lock the lid in place and set the steam valve to "SEAL". Pressure cook on "Manual", "Low Pressure" for 3 minutes, then allow to sit for additional 3 minutes. Turn off Instant Pot. Turn the steam valve and release pressure. Remove eggs and add them into some cold running water. Wrap thoroughly cleaned/scrubbed beets with foil and place on baking sheet. Bake for 1 hour at 350F. Pierce the largest beet with a skewer, if it goes in easy, remove the beets from the oven, and allow to cool. If the beets are still too firm, return to the oven and bake for another 10-15 minutes or until the beats are easily pierced with a skewer. Use gloved hands to rub the skin off the beets.